Gridlines are auxiliary lines that form a grid for easier reading of the chart. Gridlines can be vertical or horizontal. Vertical gridlines are controlled by the XAxis and horizontal gridlines are controlled by YAxis and YAxis2. Gridlines can be "major", e.g. falling on the labeled axis Step values. "Minor" gridlines appear for YAxisand YAxis2 that fall between Step values. See the figure below where major gridlines fall on 20 and 40 of the YAxis and minor gridlines fall between the major gridlines. 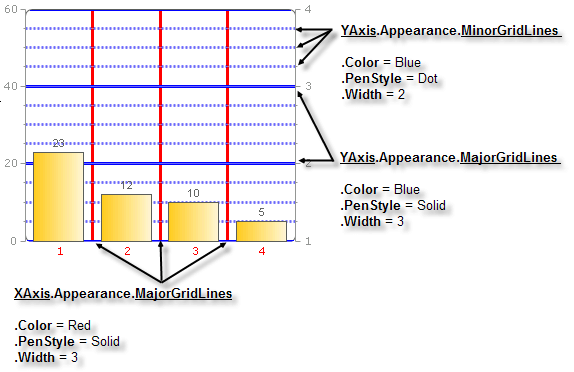 In the example below both X axis and Y axis are visible.XAxis MajorGridLines are red solid lines 3 pixels wide. YAxisMinorGridlines are shown as blue dotted lines 2 pixels wide and YAxisMajorGridLines are shown as blue solid lines 3 pixels wide.